So another brand hits the the streets, or will do with a little help. Following in the footsteps of Irish brand Kaltik comes Bake, another frame company based just over the water in Liverpool. The first frame to be released is to be early in 2013. 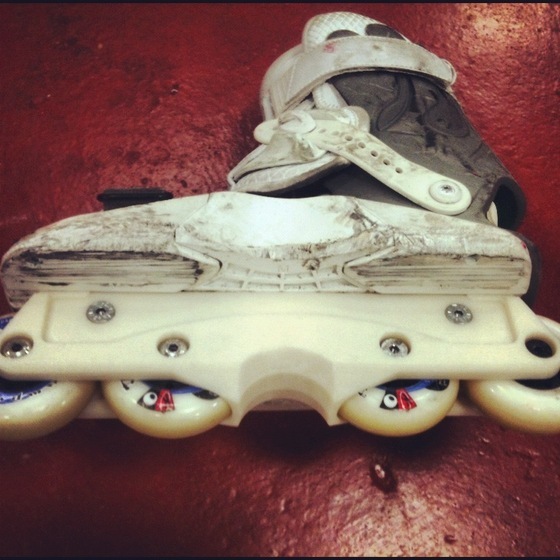 It is a freeskate style frame, accepting a flat setup of 72mm wheels while retaining a (limited) H-block. As with all frames, these are a compromise between the speed, smooth ride and control of the big wheels, and the low centre of gravity and grind space of an aggressive frame. Having a longer wheelbase than some of their competitors while retaining an absolute minimum height should make these great for bombing hills, riding natural transitions and general fun skating. The H-block that it allows will also mean they can still function as an aggressive setup (though you will really need to commit). So, here’s where you come in. The guys have invested a lot of time, effort and cash into getting to the prototype stage and now they have set up a Kickstarter project to move forward. If you are unaware of this phenomenon, it is a way to raise production capital by pre-selling to customers. Basically, if they raise their target then the frames go into production. If not, you keep your cash and no frames (at least not yet). Click here to visit the Bake Kickstarter page for more details and to pre-order (or buy t-shirts, stickers etc). I heard that there was going to be a few skaters at UKSkate last night, so I decided to take the opportunity to bring my camera down and shoot some frames. Had a good evening (and will post some of the pictures when I get to them) but once the park emptied I couldn’t miss taking some up to date panoramic photos of the three rooms. Just a quick post for the archives since I can now add panoramic images to the site. This is what The Boneyard Skatepark looked like after it’s major refurbishment in 2011. The new smooth wooden floors completely transformed the park. Smooth lines in every direction are the order of the day here. The far side of the park had also take a major overhaul. Adding in a new box/ledge (now with rail) pyramid, and long quarter with sub-box (now wallride) revitalised this oft-overlooked section of real estate. Since this image were taken, a number of further updates have been added and as always with a skater-run park there are many many plans in the pipeline. However just as a marker in the sand, this was in my opinion the biggest jump forward for the guys in the Cheshire countryside so far and deserved a post albeit a late one. Call me a hypocrite if you like, getting drawn into drama about a site that thrives on drama but on this occasion I feel it is necessary. I’ve never been a fan of Rollernews primarily because as someone who produces their own (copyrighted) content I do not like how they steal and profit from the work of others and put literally nothing back into supporting the sport. Added into that the encouragement of lies, drama and all round divisive behaviour by their readers and it’s a pretty detrimental influence on our sport as a whole. This has been highlighted recently and quite succinctly in a post by Dave Lang on Facebook where a video he shot at Nitro Circus Live was used by Rollernews, but they then blocked Dave from commenting on it. After finally getting around to processing the rest my images, here are the best of the shots I got from the Saturday at Slamm Jamm. For your convenience, I have separated them into the skating photos (at Rampworx) and the afterparty photos from the mess that went down at Bumper. Of course the photos from Friday at the park are still available if you want to check out these as well. OK, first of the photos that I took at Slamm Jamm are now uploaded. These are from the Friday Night session at Rampworx. Just trolling around the internets I came across a skate review I wrote for my friend Mike. He had been sent a couple of pairs of skates from the brand new Rollerblade ranges. This included a pair of size nine Access. As Mike is into different aspects of skating, he sent these up for me to review on his behalf. Can’t believe this was back in 2002. Ten years ago and before they hit the shops on the UK.